Analysis Qualcomm conquered the high-end smartphone world with its top-end Arm-compatible Snapdragon chips powering more than 120 smart mobes models globally. Now it's got a new quarry in its sights: the Windows 10 PC, and the x86 processors that typically power them. And also crappy Wi-Fi networks. Qualcomm wants to take smartphone-grade battery life – say, 20 hours between recharges – and smartphone-connectivity – namely, always-on 4G/LTE wireless broadband – and mix that into thin, fanless portable computers. Remember when manufacturers created franken-laptop-tablet hybrids: laptop computers that had detachable touchscreens? Well, now we're looking at laptop-tablet-smartphone hybrids. Forget two-in-ones. These are three-in-ones. Microsoft, Qualcomm, and a trio of PC makers – HP Inc, Asus, and Lenovo – really hope you'll want one. We've heard before about Snapdragon-powered Windows 10 offerings coming late 2017 and early 2018. Today, Qualcomm and its pals spoke at length on their upcoming hardware at Qualy's Snapdragon Tech Summit in Maui, Haiwaii, to 300-or-so tech journalists. You can see some photos of the new computers, here. These three-in-ones will be powered by Windows 10 – full-fat Windows 10 if you wish, not just the lightweight Windows 10 S – and run on Qualcomm's Arm-compatible Snapdragon 835 system-on-chips. They will have internal smartphone antennas and Qualcomm radio modems so they can connect to mobe networks. They are like Google Chromebooks: the idea is you store most of your stuff in the cloud, and access it wirelessly. For example, Asus's NovaGo will have 4GB of RAM and 64GB of flash capacity. Just enough to do stuff locally while offloading storage and other processing to cloud-hosted backends. While they will have Wi-Fi interfaces, they will rely on the mobile broadband connectivity so owners can reach the internet and cloud services wherever they can find reception. Did we mention the PCs will come with Office 365? They come with cloud-hosted Office 365, obviously. The computers are supposed to stay synchronized with your handheld phone, so messages and photos and other stuff are available whatever screen you're looking at. The argument from Microsoft, Qualcomm and their pals is that people hate struggling with Wi-Fi networks – from seeking out working ones to typing in passwords and jumping through other login hoops – so why not just put 4G/LTE connectivity into the PC and pipe the internet straight into the thing? The upshot of this is that you'll be expected to buy one of these PCs like you'd buy a smartphone. You'll walk into a carrier's store – online or on the street – and walk out with a Qualcomm-powered Windows 10 PC and a mobile subscription plan. Or you'll add the Qualcomm computer to your current plan for something like, some Qualy staffers estimated, an extra $10 a month. We'll have to wait to see the actual plans. You can buy the devices individually if you so wish. This massively pleases the carriers, we imagine. Sick of being seen and treated like dumb pipes of data packets, these three-in-one computers help network providers angle themselves as entertainment giants. Buy a Windows 10 mobile PC, get a 4G plan with it, get Netflix or some other telly package thrown in, watch stuff on the go, fork out more money to your carrier or ISP, and so on. Apparently, you, yes, you, hate carrying around chargers and cords, so the emphasis of these three-in-one computers is on battery life, saving people from having to recharge their laptops after a few hours and stay near a power outlet. These machines are billed as having a week-long battery life: what that really means is you can use them for up to about 20 hours between charges. The computers get a battery capacity boost because the devices are mostly battery, we're told. Internally, there are very few chips: the RAM, processor and graphics cores, and connectivity electronics, fit on perhaps one or two system-on-chips. The motherboards are, it was claimed, less complex and smaller than equivalent x86 laptop motherboards, giving manufacturers more space to cram in larger batteries. The low-power fanless nature of the mobile-designed chipset in the Qualcomm Windows PCs also means their circuitry doesn't require as much juice as beefier, warmer PCs using Intel or AMD x86 processors, so their capacity goes further. These Snapdragon Windows 10 PCs are an assault on netbook and mid-to-low-end Intel-powered PCs and Chromebooks. They are not workstations, they are not software development machines – unless you're building on remote servers – and they are not hefty gaming rigs. They are consumption junctions. They have sacrificed some performance to boost battery life. They are for people to binge watch TV shows for 12 hours straight without a recharge. You can use them for writing documents and sending emails, but for non-trivial creation of stuff, you'll have to get something more powerful, it appears. We'll get our claws on them, one way or another, to work out how well they perform. Basically, Qualcomm has fired shots across Intel's bow in the data center with its 64-bit Arm-compatible Centriq server-grade processors. Now it's firing new shells – 64-bit Arm-compatible laptop-capable chips – at Intel's desktop stuff. Crucially, these Snapdragon PCs will run x86 code through emulation. If you fire up an app built for traditional x86 Windows computers, these hybrids will emulate an x86 processor and execute the app as if it was running on an Intel or AMD-powered system. And it will do it fairly slowly – not terribly slow in normal use, but noticeably slower when doing intensive stuff like installing an application – so you'll want to grab universal apps from the Windows Store that run natively on Arm. The emulation, judging from Qualcomm's benchmarks, isn't cripplingly slow – normal tasks should just work fine – but anything heavily CPU-bound will suffer. This emulation fallback means Microsoft and Qualcomm can avoid the disaster of Windows RT, which ran on Arm-powered tablets, ran Arm-only programs, and thus had virtually no software. Now, there are more universal apps that run on Arm and x86, and emulation just in case there is no Arm flavor of an application available. Windows 10 has also been ported to Armv8. The operating system does not run under emulation. For what it's worth, AMD and Qualcomm are working together to produce hardware for laptops: AMD doing x86 Ryzen and Vega CPUs and GPUs, and Qualcomm doing the LTE radio modems. This drives home the point that this is a declaration of war on Intel by Qualcomm. For us, here at El Reg, we don't mind carrying around chargers and cables. Also, we're not homeless, so we're never far from a power outlet – at home, in the office, the cafe or even the bar – so the long battery life, with some performance sacrificed, doesn't totally appeal to us. It may not appeal to you. It may not make much sense to you – if you're binge watching TV in bed then you'll be near a power outlet, surely? If the battery part leaves you confused or unimpressed, then perhaps never having to faff around with Wi-Fi will again will appeal. Until you hit your monthly data download cap. One group in particular is going to ruin this three-in-one dream: the carriers. Qualcomm staffers are confident they've persuaded the network providers to not screw this up with outrageous costs and cruel download allowances. We hope this arm-twisting worked. When Windows 8 came out, it didn't matter how good your processor chip was in a new laptop, no one would buy the hardware because no one wanted Windows 8 that came with it. 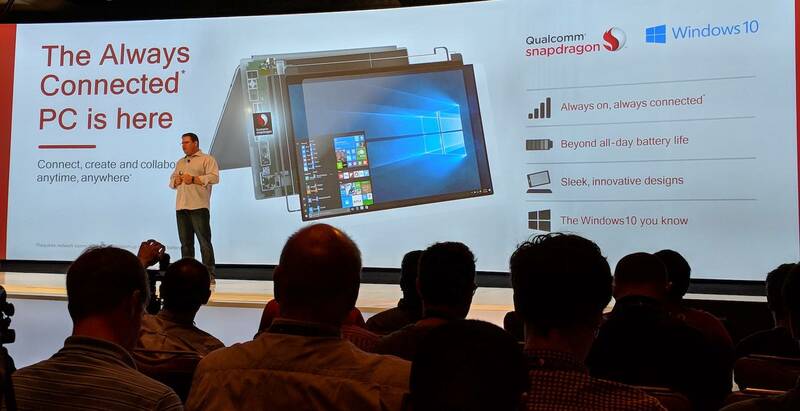 And we can see the carriers sinking Windows 10 on three-in-one Qualcomm devices with terrible 4G/LTE plans. So basically, if you hate having to recharge your laptop or hook up to the mains all the time, or you hate fighting crappy Wi-Fi, and you don't mind forking out a little extra for a laptop 4G/LTE connectivity, then this new gear may be for you – and Microsoft and Qualcomm are adamant there are millions of people who fit into these categories. We'll update you on more developments at Qualy's tech summit as it happens. Qualcomm also revealed its next Snapdragon chip will be the 845 – it won't talk about that in detail until tomorrow.